Brenda Lee Asp, born and raised in Whitehorse, Yukon and Telegraph Creek, British Columbia, has a diverse ancestral background. A member of the Crow Clan, Brenda’s background consists of Northern Tutchone First Nation from the Snag area of the Yukon and Tahltan from Northern B.C. Brenda’s lineage consists of Athabascan and Tlingit cultures, and her European ancestry is German and Swedish. Brenda’s calling as a visual artist began as a child with her mother Elizabeth Nieman; her grandmothers Thelma Norby (nee Edzerza), and Anges Nieman (Nee Jack) and numerous aunts. These influential women inspired Brenda to learn the art of custom clothing and concepts of print design that lead her down the path to graduate from the Blanche MacDonald Centre in Vancouver, and receive her Fashion Design Diploma in 2010. Brenda can still feel the spirits of these women in the moments when she’s creating. Starter pieces from Brenda's mother, Elizabeth. "Traditionally, my family was nomadic like most First Nations peoples; they travelled great distances for food and marriage. My fondest memory was travelling with my grandmothers to meet new people and more family throughout Yukon, Alaska, and British Columbia. Growing up I recall harvesting salmon from the Stikine River in B.C. We spent time on the land in the Yukon picking berries, wild mushrooms and cooking by the campfire while enjoying a cup of campfire tea; enjoying the land whenever we could. Harvesting and using materials from the land and earth elements creates the backdrop for my artwork, prints, jewelry, and designs." Brenda Lee Asp captures her family values, with foundational cultural teachings to bring life to her pieces, made from unique, organic fabrics that feel good on the skin. Brenda Lee Asp produces each piece with pride, in doing so, her pride transfers to every final owner. From the matriarchal influences in her life, Brenda learned the importance of hard work, planning and precision, and utilizing the resources surrounding her. Each piece of clothing is created with tradition and pride, Brenda utilizes the materials harvested from the land. She uses unique colours rooted in her heritage like salmon and turquoise. She creates styles and shapes that have a modern twist on traditional shapes and styles. beleev. Mind. Body. Spirit. Gifts. Brenda Lee Asp creates Indigenous inspired clothing that has a modern twist on traditional shapes and styles. Products ranging from suit jackets, tops, skirts and shorts. Fit and flare tops, capris and pants, blazers, jackets, and jumpsuits. Finally, leather skin dresses and gowns, Brenda brings her Northern Tutchone and Tahltan cultures to life through the designs featured in her clothing lines. All clothing she produces uses materials such as silk, italian wool, velvet, cashmere, rabbit fur, bamboo suiting, leather, or spandex and features silk print designs with silk lining. 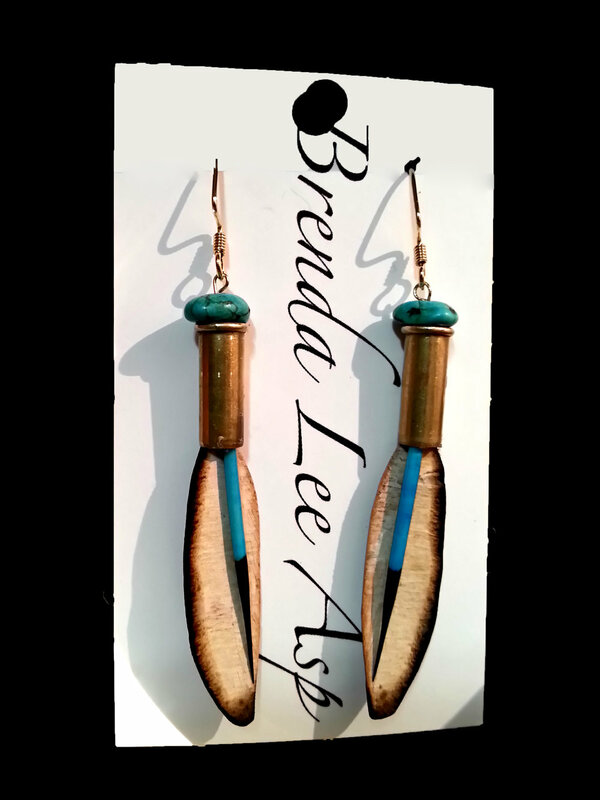 Brenda Lee Asp creates numerous different accessories for both men and woman. From silk ties, scarves and buffs-headwear she creates accessories that capture the Northern Tutchone and Tahltan cultures. 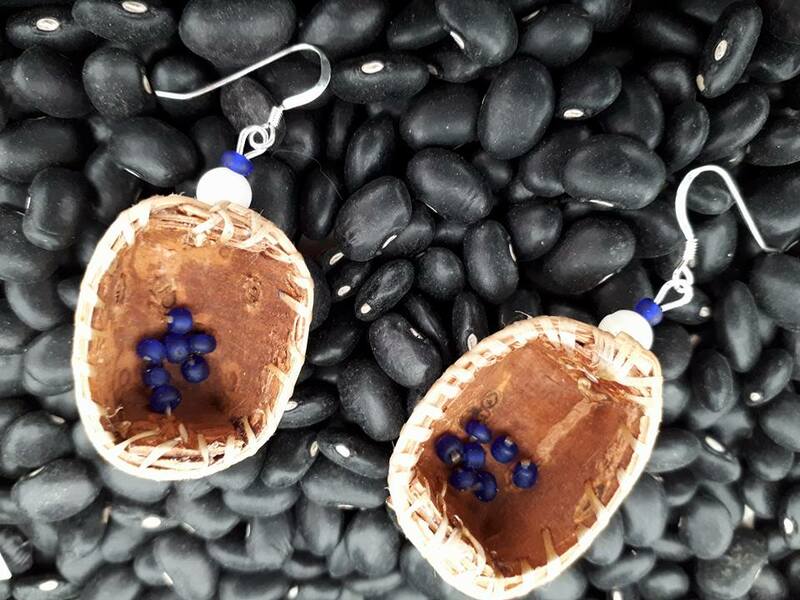 She hand crafts jewelry with materials harvested from her communities, she uses such materials like porcupine quills that are naturally dyed, gun shell casings, birch bark and feathers. She also creates button blankets featured with Coast Art form lines and traditional designs. Every story cape Brenda creates has it’s own name and story. The flowers on the cape are, as explained by Brenda Lee Asp, the stories of her ancestors. The tiny triangles outside the flower represent the berries. The leaves represent the river systems travelled. The long dark parts in the middle of the petals represent the sun. The big circles inside the petals represent the buttons they used to trade. The small shapes with the dot inside them on the tips of the petals represent the salmon. Finally, the flowers centre represents animal skin. Featured in Otahpiaaki 2017. A special thanks to Angel Aubichon for featuring the earrings in this photo. Reconciliation Cape, featured in Otahpiaaki Fashion Week 2017. Brenda Lee Asp creates custom made Northern Tutchone and Tahltan inspired mukluks, these mukluks feature custom artwork and beading. These mukluks are made with harvested materials such as leather, fur, and lace, and can feature custom silk print of custom beading designs. During this era of reconciliation in Canada, the preservation of traditional Indigenous culture and heritage is essential. Brenda Lee Asp recognizes this as a priority and keeps these traditions, protocols, and heritage embedded in her work. Brenda Lee Asp feels the need to give back to the community and share the knowledge that has been passed down to her from her lineage. The time she has facilitating workshops is just about the same as her creation time, nurturing others to achieve their full potential in the art of Indigenous culture and creation. The Truth and Reconciliation Commission and the 94 Calls to Action specifically calls upon the federal government to ensure the protection, preservation, revitalization, and strengthening of Indigenous languages, and cultures. Brenda Lee Asp contributes to this work of reconciliation in Canada by teaching others and sharing the sacred knowledge passed down from her lineage. Thank all of those who supported me and helped me in various ways to over the past years, those who helped me get my collections completed and helped to get them to the shows to let the world view the pieces.